The Stooges formed in 1996, led by tuba and trombone player Walter Ramsey. Ramsey attended John F. Kennedy High School and trained at New Orleans Center for the Creative Arts (NOCCA), and chose his instrument after an elementary school classroom visit by Rebirth’s Philip Frazier. Hurricane Katrina scattered the bandmembers, although Walter continued to produce material under the name Stooges Music Group. This material included Ramsey’s original “Why Dey Had to Kill Him?” which referenced the 2004 shooting death of Joseph “Shotgun Joe” Williams. 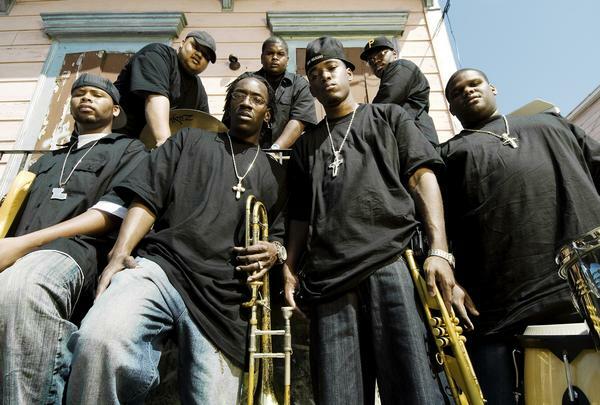 Following Hurricane Katrina, The Stooges revamped their lineup, adding co-leader Virgil Tiller (saxophone), bringing back original member “Garfield” Bogan on trombone, and incorporating a rotating group of younger musicians. In the years since the storm, The Stooges have become one of the most recognizable bands on the parade circuit, helped by the fact that they often parade with two tubas. In addition to their parade and festival appearances, The Stooges played a legendary weekly Thursday night show at the Hi-Ho Lounge on St. Claude Ave until 2012. The demands of touring have cut back their local appearances, including at second line parades, and fans continue to wait for their second album.